St. Martin's Press, 9781250091239, 336pp. 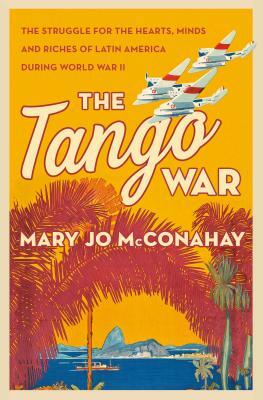 One of WW2 Reads "Top 20 Must-Read WWII Books of 2018" • A Christian Science Monitor Best Book of September • One of The Progressive's "Favorite Books of 2018"
The Tango War by Mary Jo McConahay fills an important gap in WWII history. Beginning in the thirties, both sides were well aware of the need to control not just the hearts and minds but also the resources of Latin America. The fight was often dirty: residents were captured to exchange for U.S. prisoners of war and rival spy networks shadowed each other across the continent. At all times it was a Tango War, in which each side closely shadowed the other’s steps. Though the Allies triumphed, at the war’s inception it looked like the Axis would win. A flow of raw materials in the Southern Hemisphere, at a high cost in lives, was key to ensuring Allied victory, as were military bases supporting the North African campaign, the Battle of the Atlantic and the invasion of Sicily, and fending off attacks on the Panama Canal. Allies secured loyalty through espionage and diplomacy—including help from Hollywood and Mickey Mouse—while Jews and innocents among ethnic groups —Japanese, Germans—paid an unconscionable price. Mexican pilots flew in the Philippines and twenty-five thousand Brazilians breached the Gothic Line in Italy. The Tango War also describes the machinations behind the greatest mass flight of criminals of the century, fascists with blood on their hands who escaped to the Americas. A true, shocking account that reads like a thriller, The Tango War shows in a new way how WWII was truly a global war. Born in Chicago, MARY JO MCCONAHAY is an award-winning reporter who covered the wars in Central America and economics in the Middle East. She has traveled in seventy countries and has been fascinated by the history of World War II since childhood, when she listened to the stories of her father, a veteran U.S. Navy officer. A graduate of the University of California in Berkeley, she covers Latin America as an independent journalist. Her previous books include Maya Road and Ricochet. She lives in San Francisco. "If you think the history of World War II in Latin America is just about Nazi spies, you are in for a surprise.